How do “warm” and “cool” translate in regards to what your light looks like? 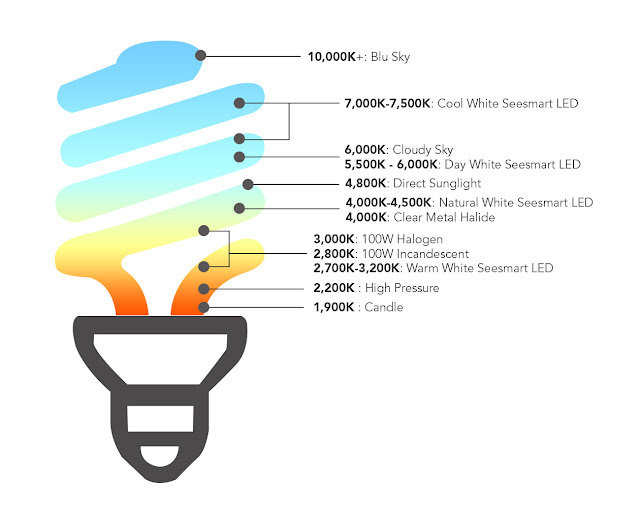 Here's a breakdown of the Kelvin chart and what color temperature really means. The Kelvin definition is “the SI base unit of thermodynamic temperature, equal in magnitude to the degree Celsius.” Scientific jargon aside, Kelvin is used in lighting to measure the color temperature of a particular light bulb. And in short, the higher the Kelvin rating (expressed in K), the whiter the light will be. Light bulb color temperature is represented in the unit of absolute temperature, Kelvin, noted by the symbol K. Household fixtures are commonly found in color temperatures on the Kelvin scale of 2700K (warm incandescent), 3000K (warm white halogen) and 3500K (household fluorescent). Color temperatures higher than 3500K are typically used for commercial and hospital applications, as the light is bright and has a bluish daylight cast that can be harsh for home interiors; but task lighting may be useful at 4000K and above. When selecting new lighting for your home, be sure to take its color temperature into account to ensure you're making the right choice. The right color temperature begins with the bulb. Use the Kelvin temperature color scale below to help identify the approximate hue certain bulbs will provide. Aside from the type of the light bulb itself, using Kelvin temperature can also help guide you in determining which fixture is right for each room.